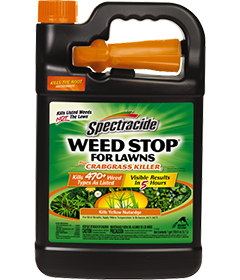 Use Spectracide Weed Stop For Lawns Plus Crabgrass Killer3 (Ready-to-Use) to kill over 470 types of weeds as listed, including crabgrass. The product produces visible results in 5 hours. 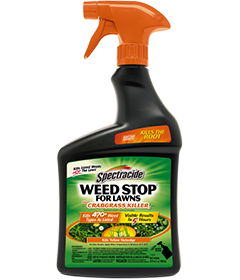 This product kills broadleaf and troublesome grass weeds including dandelion, chickweed and clover as well as crabgrass, foxtail and yellow nutsedge, see product label for complete list of weed types. Apply when daytime temperatures are between 45°F and 90°F. Do not apply to Bermudagrass when daytime temperatures exceed 85°F. Turn nozzle to coarse spray pattern. Avoid sprays that are too fine because they can drift and damage other plants.